I’m not, when I’m in a pub, a great worrier about what shape of glass my beer is served in, unlike my father, who would only drink out of a thin-walled straight glass – he said he couldn’t stand the feel of the thick-glass “mug” against his lips. The straight-sided, or slightly sloping-sided pint beer glass has been around from the early 20th century at least. But the authentic English “four-ale bar” (public bar) pint mug up to the end of the First World War was actually a china pot in a bizarre shade of pink with a white strap handle – see George Orwell’s classic “Moon Under Water” essay from the Evening Standard in 1946, where Orwell, always the inverted snob, complains that this working-class mug was getting hard to find. The usual sort of glassware in Edwardian pubs was a handle-less sloping-sided, thick-walled “straight” pint mug (pewter was restricted to the saloon bar). Around 1928 the 10-sided or “fluted” handled glass pint mug came in, and this is the pint glass seen in all the “Beer Is Best” advertising put out by the Brewers Society in the 1930s (it is also, in this drinker’s opinion, the finest glass to consume English ale from). The “dimple” pint arrived about 1948 1938, and eventually drove out the “fluted” glass in the handled pint field (although 10-sided pint glasses were still being made as late as 1964): the arrival of the dimple coincided with the triumph of bitter over (dark) mild, and amber beers look better in dimpled glasses than in straight-sides ones: the light shining through a pint of bitter in a dimpled glass is the beery equivalent of the windows of Salisbury or Chartres. Meanwhile in the early 1960s late 1940s the major problem of “straight” glasses – their tendency to chip or nick where the rims rubbed together during washing and storage – was solved by the invention of the “Nonik” (no nick) glass, with its strengthened bulge about an inch or an inch and a half down from the rim, where the glasses could rub together without harm. Unfortunately, it might last longer, but the “Nonik” has to be the ugliest, least attractive container to drink beer from ever forced upon a sullen public – it does nothing at all for the aesthetic qualities of the liquid it contains. A variation, the “waisted” thin-walled pint glass, which pulled the rim in slightly to avoid the possibility of “nicks” , has been take up most enthusiastically by stout brewers, and as a result since the 1970s it has become the classic Irish/Guinness pint glass. It is also used extensively in the North of England for serving Yorkshire-style “big head” pints. 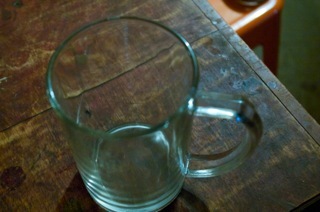 Now the “Nonik” appears to be disappearing, replaced by tall, narrow, only slightly tapered thin-walled pint glasses. However, beerglass forms can be very conservative: the “tulip” half-pint lager glass, as lusted over by John Mills in the film “Ice Cold in Alex”, is now at least 60 years old. Remember pint glasses are 20 oz and if it is 16 oz, it is not a legal pint glass. In USA, Americans discriminate saying 16 oz ia pint glass pint glass because it is all about money than serving the true original 20 oz as 20 oz is a world wide glass. Hi. I am doing some research for a 1940s re-enactment group and need to know what sort of glasses would have been used in an English pub in 1940/41. This is the best article I have come across so far. Can anyone suggest where I can get the right glasses, or, (as I suspect) that is impossible, what is the nearest modern equivalent? Owen, you’d be safe, I’m sure, using dimple pint glasses, they were certainly in use by the end of George VI’s reign, or “straight” thin-glass sloping-side handleless glasses – not the “nonik” kind with the bulge near the top, these are definitely 1960s only from 1948. The most authentic are the 10-sided glasses I describe, but these are now very hard to find, alas. Just found this query of mine from nearly 10 years ago!!! Been pottering around in this area ever since. About a year ago I picked up 14 ten-sided King’s Crown 10-sided mugs at a bootsale for £5 – been distributing them to friends ever since. Have also found some really interesting variations, one way and another. I have 6 of what I think are the 10 sided handled mugs mentioned here. On one side they have “PINT G R 64” with crown between the G and R. I got them in England in the ’80’s. Does that match what you are describing? You mention 12 sided glasses in the last comment but 10 sided in the main description. Yes, you’ve got six of the classic 10-sides beer mugs (whoops, the post above should have read “10-sided” too) – the GR 64 with crown on your glasses is the verification mark, put on by the local town council to show they had been verified as having the correct capacity, ie exactly a pint, and according to Hugh Rock’s Pub Beer Mugs and Glasses the number your mugs carry shows they were made by Henry Greener in Sunderland between 1910 and 1930 (the GR, of course, stands for ‘Georgius Rex’, representing King George V), so they’re something like 80 years old – look after them! Excellent article, Zythophile. I always wondered what a nonik (or nonic as I’ve seen it spelled) glass meant. I thought it might have a Latinate root, possibly relating to the measure of a vessel, or another exotic explanation (a la Plimsoll Line), and now I learn it is a practical, recent coinage for a glass whose rims will not chip in washing, most interesting! When it comes to beer glasses I worry most about cleanliness. One cannot always take a clean odourless glass for granted, in my experience. Sometimes they give off a dirty soap kind of smell. I sometimes ask for a glass of water and use that to rinse out a glass that is suspect. I like pewter mugs for bitter, it seems to do something positive to the light bubble in a good cask beer. In London, the Davy wine bar chain’s excellent Wallop is served in those mugs (or was on my last trip in 2005) and it always tastes great. The one thing I don’t like is branded glasses. I guess I like looking at the beer “toute nue” and not through the prism of a name or logo. I’m all for brewers’ adverts but not on the glass. If I had a favourite glass, it would a thin-walled sleeve sans bulge of any kind. You refer to a ‘soapy’ smell in your beer glass. One possible explanation:- In the 60’s I worked in many a pub dispensing pints at a terrific rate on a busy night. If, when washing the glasses, a residue of detergent was left and the glasses not rinsed very well then it was so much easier to pour a pint without having to wait for the head to settle (the detergent killed the froth). This particularly applied to White Shield Worthington – a very lively ‘sediment’ beer. I can now go to my grave with a clear conscience, this would appear to be as good a confessional as any other. In the US, the thick, ugly “shaker” glass is called a pint glass because, in the US liquid measuring system, 16 US ounces IS a “pint”. (US Revolution and all that- we don’t use the UK’s measurements). When the “Nonik” glass is used here in the US in some beer bars, it is correctly called an “Imperial Pint” but it is by no means common or has it had a very long exisitence in the US. The problem with the “shaker pint” (besides it’s look) is that it was never designed for drinking or serving beer and its “16 oz” capacity is to the rim- thus, with any head at all, the drinker is not getting a full US pint of beer. Compound that with the fact that glass manufacturers make almost identical glasses in 14 oz. and 12 oz. sizes, and that is the real crime in the US bars. (Except for the fact that there’s no standard beer glass in the US, and most local regulatory gov’t agencies don’t seem to be bothered by the short servings or mis-use of the “pint” term). Of course, you still hear the expression “a pint pot”, but most people assume it refers to a dimple glass (perhaps to distinguish it from a straight one), whereas it seems obvious that it actually dates from the time of the china pot. Were there ever regional differences in the preferred glasses? I had always had the notion in the back of my mind that the straight glass was usual in Scotland and the North of England, and the dimple glass in the South. But I have no evidence whatsoever. Is there anything in it? Other way around I’m afraid. Certainly during the ‘sixties and ‘seventies they preferred straight glasses in scotland, but in the north of England [or my part of it at least] the dimple/handled glass was the norm. Change came in early ‘seventies with the introduction of straight glasses dubbed ‘southern’ glasses or ‘schooners’. No-one liked them but their popularity grew as the the market for lager took off among a new, fashion-conscious generation of drinkers unconvinced of native English beer’s taste and even more so its higher temperatures. There’s evidence of what I’m saying in films of the period as a matter of fact. You might remember the scene early in ‘Get Carter’  where gangster Michael Caine’s character, Jack Carter, new to the North-East, orders a drink in a pub. The barmaid plucking a dimpled glass from the shelf is then used to establish Carter’s Cockney outsider credentials when he extends an arm in her direction and peremptorily clicks his fingers to get her attention. ‘In a straight glass,’ he insists. I never said dimpled glasses were unknown in the south of England, or even suggested they were uncommon, merely that usage was predominantly confined to the south of the country, and that it in my neck of the woods [north-west England, but across the north generally at the time] straight glasses for men were unusual enough to be labelled a ‘southern’ importation. The scene from Get Carter illustrated a cultural difference that was no less real for its being comparatively minor. I have four 10-sided “Nonick” (we are not sure on this name, just researched) beer glasses. The mugs are 10-sided with what looks like the Letter N the some sort of motif within the letter. On the botoom of the glass it says British made. Can anyone tell anything else about these glasses? If they’re 10-sided they’re not Noniks, that’s the name for circular-cross-section thin-walled glasses with a bulge around an inch or so below the lip. Dunno what the “N” might be I’ve only ever seen examples with GR, EIIR and RAF on. Can you send us a picture? I’ve got about ten or a dozen 10 sided glasses, both pint and half, that I’ve collected over the years. One has RAF on it, one has GR 301 with C beneath it, one has GR 64, a half pint one has GR 323 and ccc beneath it. I’ve also got a tall pint glass which is smooth on the top half and ribbed on the bottom. The sides slope in towards the bottom. It has 16 ribs. It’s got GR 478 on it. What does the 323 mean? I now live in Oregon and also have my Dad’s original 60 darts and such. I always thought it was C.C.C. as my grandad worked for Cheshire County Council also has E.R. 323!! Cheshire had a host of numbers, but none resembling 323. I have what I guess is a 1940’s pint glass. It is semi straight although fluted at the bottom. It bears the stamp “PINT crown GR478. ” There is an etched scroll bearing the legend “G.L.White Duchess of Kent Prebend ST. N1.” The pub remains today and I may take the glass back next time I’m in the Smoke and enjoy a pint using it. Excellent site – many thanks indeed for the link. I am designing a Modern Symbolic Mae and will include a dimpled pint pot in the design.One of my favourite objects (who designed it ?) I was out in California October lecturing on Vintage Thinking and took an old Strongs Brewery pint Pot out to The Irish Pub in Sonoma. All who visit that pub can use my jug. Could I promote pint pot by using your black and white iamge ? Since I nicked the picture from somewhere else anyway, I have no problems about that at all – it comes from a 1960s hardback pub guide. I own a set of four dimple mugs with the etching of “PINT” then under it a crown, then under that “G.R, then under that “478”. Does this mug also date back to the 1940’s? I happen to notice the etching and thought I’d look into it. The 478 indicates that it was given its weights and measures verification in St.Helens and were probably made at the Ravenhead glass factory. The GR is George VI who reigned from 1937-1952 so your glasses range from somewhere between those two dates. It’s unusual that they are dimple mugs though. I have a dimple mug which I think is from George V 1910-1936 and it’s possible yours date from then too. A picture would help, especially of the crown on the weights and measures mark. PS. The average lifespan of a pint glass in a pub is 4 months. I have 6 half pint round glasses which i inherited with the house we moved into 5 years ago. They have “Half Pint, then a crown with G.R 323 and CBG. Could anyone tell me how old these are and if they have any value? Well, 323 is the weights and measures number for Gateshead. CBG is anyones guess (City Borough Gateshead? ), but it is likely to be a pub, working mens club or somethng like that. Half pints always sell for less than pints (if they sell at all) 10 sided ones sell for more than the ‘dimpled’ barrel style, of which there are a couple of styles (the difference is in the shape of the dimples) Half pint GV dimpled glasses sell for about a fiver each on ebay but sometimes they don’t sell even at 99p, it just depends on the day. It’s unusal that you have 6 of them, that might generate a bit more interest. Are they the dimpled barrel style or the 10 sided straight style, and are they damaged in anyway? In your response to Crysta (7th Feb) you indicate that a picture of the crown might help distinguish between GV and GVI. Does this mean that they changed the shape of the crowns when GVI came to the throne? If anyone has any more information on this, I would be very pleased to hear from them. Regards Paul. I have added a new post that addresses your question. Please have a look and let me know what you think. In the light of your latest postings, I have done a bit of online searching, and came across (via Google Books) reference to “Weights and Measures and their Marks” by John Thomas Grisham (2003, Shire Books). On p.29, it states that “In the absence of a date mark ……. there is nothing to distinguish the GR stamps of George V from those of George VI. These cover the years 1911 to 1952 (no change was authorised during the brief reign of Edward VIII)”. So it it seems unlikely that individual authorities would have felt obliged to change their marks with the the change of king. Perhaps the difference in the shape of the crown simply reflects the interpretation of the engravers that produced stencils for the different authorities. Incidentally, pages 30-31 of the same book gives a list of all the official stamp numbers (323 = Gateshead, etc). Sorry that this seems not to support your theory (posted 29th October). If it’s any consolation, you will be pleased to hear that I am a GCC convert. If I use my magnifying glass, I can now see that the first supposed “C” on my standard-quality marks has a slightly squarer end than the other two! Oops! It is, of course, Martyn’s website! i envy the variety and history of beer glasses you seem to have in the UK. we’re stuck with nonicks in canada and they’re terrible. they have these ugly labels on them and they’re too easy to knock over (oh, the nights i’ve ruined). i agree with you about how little they do for the beer. i find they also blow a bar’s cover. stains stick to nonicks for some reason (maybe it’s the thin walls). you should kickstart a glass making revival movement. please. i’d spend my savings to visit. have people in your house melt glass and sip ale. I’ve just picked up one of the ten sided pint glasses with 1966 etched by the crown sign and a picture of two footballers and the words “Russia” and “Colombia”. I’m assuming it’s some sort of world cup memorobilia that was sold at the time. Number 478 below the crown. The pint beer glass with many angles in it is something I think dates back to 1947. As a designer I enjoy the various feels one gets when holding it in various ways. Holding with the robust handle is one way. Holding with the hand passing on the inside of the handle is another. Holding with the hand on the opposite side with the fingers within the circle of the handle but on the body of the glass is another. So much less boring than straight sided glasses. I am in England drinking in places where the same activity has taken place for 500 years. In The Irish Pub in Sonoma California I left an old Strongs Brewery mug, feel free to use it. The ten sided pint is one of my favourites too. I was recently lucky enough to pick one up with the GVI RAF badge on it. I wonder if the owner was a Spitfire pilot during the Battle of Britain? It conjures up fantastic images! That basic design is actually Victorian but in those days they were slightly taller, narrower, and had thicker glass, but still the same basic shape. Did you buy it on e-bay? I sold one earlier this year, I wonder if it’s the same one. Yes it came from Ebay (this year i think) and its a half pint, a real beauty. I have never seen any other RAF ones, so probably very rare. If it is the one you sold, how did you come by it, if you don’t mind my asking? The one I sold was a pint glass but the RAF mark looks the same. I got it from a charity shop for a £1 or so. I’ve collected them for years and still have a few which I will thin out this winter. The RAF one is very rare I would think. The Royal Cyphers of George V, and George VI both used St. Edward’s Crown. However it is depicted slightly differently for both Kings on letter boxes (for example) I think this is true for the crown used in weights and measures marks that were sandblasted onto pub glassware. So, just by looking at the crown on a piece of pub glassware you might be able to tell whether you are looking at a George V or George VI piece. The difference is that the George V crown has straighter arms leading up to a point just below the cross on the top of the crown, whereas the George VI crown has slighlty rounder arms giving a more rounded overall appearance to the crown. In the picture below I have made a collage of George V and George VI crowns as depicted on letter boxes. At the bottom of the picture I have included two pictures, a George V crown (angular in shape) and what I believe is a George VI crown (rounder in shape) used by Weights and Measures authorities at the time. I would really appreciate it if anyone could express an opinion on my theory, as I don’t think it has been put forward before. Many thanks for your reply Robert. You may well be correct about the crown shape. Unfortunately I don’t have any GVI dated glasses so I can’t compare crown shapes directly. So I would like to ask anyone who has a dated (commemorative etc) glass to simpy post here the date and whether it has an “angular” or “rounded” crown as shown in the link I posted earlier. I’m glad you could confirm the GCC which I’m sure stands for Gateshead City Council just as LCC is London City Council (or was it County?) on some glasses. I have been in contact with the W&M officer for Gateshead who was very helpful but was unable to confirm it. I have a 10-sided 1/2pt glass marked “HALF PINT” above an angular crown beneath which is “GR” above “301” above “c”. However, around the rim is etched “LONDON & NORTH EASTERN RAILWAY”. Would this be of collectable interest? So the glass dates from between 1910 and 1948. Of course, I like my idea of the ‘angled crown’ theory (well at least I’m honestly prejudiced!) so I would put it between 1910 and 1936, as pub glassware was more common later in that period I would guess it’s from the early 1930’s. George V & VI pints sometimes don’t sell, but sometimes they go for £20+ I think the most I saw one go for was about £60 and there didn’t seem to be anything very special about it to me. Half pints are not as popular as pints, but yours has the LNER which is a big plus. I’ll put my neck out and say that if you put it on ebay it would sell for £15-£20, probably to a railway enthusiast. Caveat: There’s a fair bit of speculation in the above. Paul, very many thanks for your most informative reply. I bought one like this 6 months ago for .99p, which goes to show you can get lucky. I was given a link to your site by Paul Townson.He is suggesting a design difference between Geo.V and Geo.V1 crowns. Like you I think the accepted position is that there is no difference. you?Anyway I have yet to reply fully ,largely because I’m unable to send him a scan at the moment. I wish I had known about your site before, because you have a lot of knowledge some of which I would like to use if I may! I would be grateful if you could visit abeerglasscollector.com and tell me what you think.I am going to put a link to your site when I can get hold of my webmaster. I would very much like to know what kind of glass/jug/mug would have been used in pubs around London’s Smithfield Market, for serving beer, in circa. 1840. Glass was also used and of course pewter. That’s exactly what I was looking for. That’s nice, Stuart. Do turn caps lock off when you type a comment, though, it makes you appear as if you’re shouting, and others are likely to make unflattering assumptions about you. Re US vs UK pints. I believe the US pint is the same as the UK pint previous to the 1824 change to “decimalize” the system for the Commonwealth. So, in effect, the US is the more traditional measure. However, that said, I like bigger classes so I can get about 20 oz of beer PLUS a couple of inches of head. Fantastic Site/ Thank you. I have read most of the posts and reply’s and didn’t see the mark I’ve got on this half pint I’ve just dusted off from the attic. Etched stamp looks like this- the words” Half Pint “(over a circle) containing a crown, V.R, 323) I had been told by Mum that the V.R stands for Victoria Reigns! Oh yea and it’s a 10 fluted handled number. Now that I’ve spent the last 45 minutes trying to track down its origins I think I’ll put it to its intended purpose. Thanks. That would be “Victoria Regina” – “Victoria Queen” in Latin – rather than “Victoria reigns”. ER (if it is ER and not a mistaken EIIR, which often happens) means Edward VII who reigned from 22nd January 1901 to 6th May 1910 so your glass was verified by the Gateshead verifying chap sometime then. Straight sided glasses typically go for 20-30 on the net but a rare design may go for more. Handled ones are much more desirable and rarer too. Unless you are in desperate need of about 25 quid just use it and enjoy the fact that you have a true antique pub pint glass (i.e. >100 years old) – very few people do. This is a great article. I am having a debate with a friend over the term sleeve as it refers to beer glasses. I suspect that it might have been coined after the introduction of the Nonik glass for those folks that wanted what they were always used to getting—the straight thin-walled beer glass. But, alas, I am guessing. If anyone knows the actual origin of the term “sleeve” it would be great to hear from you. Today I bought a lovely pottery beer pot. It is well used and has a lovely design on it of some hops. It is stamped ‘imperial pint’ in black. The word imperial is on a ribbon design. It has (in red) a crown. Under the crown it says V 93 R and under that 32. Is the 93 the year (1893) and the 32 the area? If the 32 is the area, do you know where it is from? Sounds lovely – I’m jealous. Come in please Paul Townson – can you help this lady? I have taken a picture of my beer mug. I must add this is a really interesting site. I have enjoyed reading it and looking at the links people have posted. It’s a really nice pot and I am envious as well. Victorian glass pints sell for about 75 pounds, but I think yours is probably a bit more collectable so I would stick my neck out and say it’s worth up to 100 depending on the condition. If you don’t mind my asking where did you buy it and how much did you pay for it? Please don’t tell me you got it at a car boot sale for 50p! Thank you for your fast repy to my questions. It is so nice to be able to date something and to know where it was made. There is no makers mark on it at all. As I said, the pot is well used so the condition isn’t brilliant. It has an old chip near the base, some discolouring to the glaze especially around the rim and on the handle, the glaze seems to be worn away and it has crazing inside. I think all the flaws give it character. I have taken some more pictures for you. As for a boot fair for 50p, you aren’t far wrong. I got it from an antique fair in a local church hall. It had £7 on it but the sellers were all having a bad day because it was so quiet and when I picked it up the woman said to ignore the price and that I could have it for £3. Thanks again. It will have pride of place on a display shelf. I bought it because I like it and it is nice to know it does have some value too. Thanks very much indeed Paul, and well dome Kay – I would agree with you, the fact that your mug has clearly been well-used gives it extra character – if it could tells tales I am sure it would have some great ones. Great web page. I’m writing from Australia, and I’ve been collecting interesting beer glasses whenever I come across them in thrift shops. Since discovering your site I’ve been looking over the glasses I’ve got and have been surprised to find a few of them have the British inspectors stamps on them. Recently I picked up an electro-plated nickel-silver tankard, half pint, with a crown 37 on it. This, I discovered, is the Sheffield inspector. Beside the crown is a 5 over 70, which I assume is the date? The vessel also has the “The Churchill” stamped into it. There seem to be a number of Churchill pubs in the UK, but I wouldn’t know which it one it’s from. It’s an interesting item, though I find it hard to imagine anyone drinking out of such a thing in 1970. Any information you have to help me understand this curiosity would be much appreciated! I’ve recently picked up a dimpled pint pot with the King George crown on it. It’s the first one I’ve seen apart from a half pint one ( if you know what I mean). I recently bought a Georgian (George III) ale glass…. its not pub-ware its a fine crystal thing engraved with hops and barley. Its pretty small but that reflects the strength of the ale back then – more barley wine than beer. I like it but i still prefer my pressed glass pub-ware collection – i use them regularly when drinking real ale in the house. They’ve all come from boot sales and charity shops etc. Amazes me how many must have been “borrowed” at some point or other! I’ve got 17 different glasses now dating from George VI to Victoria – I will post some pictures of them if people are interested? Are there any other collectors out there? Yes! I collect pressed glass pubware as well. I too have a collection of GRV and GRVI pint and half pint glasses that I have accumulated over about 15 years, and would like very much to see any photos you have. I also know of one other collector who has quite a serious collection. Any chance of some pictures, it would help enormously. Hi Paul, I have taken some photos and they are on my computer but I’m not sure how to up load them onto here? Hi Paul I’ve uploaded some pictures of the glass (there should be 5 altogether), hope you can view them, please let me know. It looks like your pint is from the John Derbyshire glassworks in Manchester. The anchor design (anchor with JD on either side of it. The JD looks a bit like a rope. Just have a close look, I can’t see very well in the photo) was first used 1873 so it seems a bit odd that the engraving is dated 1822, unless Josiah Townley died in the 1870’s (or something) and someone etched it as a commemorative mug, that would have put him in his 50’s so it’s quite possible. I would guess it’s worth £10-£20. Glasses with weights and measures marks are more collectable (ie. are worth more) but never the less, it’s a nice glass with a bit of history with it. Use it and drink a toast to Josiah Townley! Thanks for your reply and time given, I’ve looked at the picture you scanned for me and yes you are right It does look remarkably similar to the one I have, the initials on the bottom of the glass could be JD but it appears to me, to be more like a TD, if it is from John Derbyshire though I think it becomes even more interesting to me, as I read somewhere that he was the first manufacturer to use a logo (not sure whether its true or not), as for Josiah Townley I believe he was a blacksmith who came from the next town over (about 3 miles away from me) and lived from 1822-1897 (he lived quite a long life for the times). Very interesting indeed. I have numerous GR and oversized pint glasses. One that puzzles me is a long thick pint glass, no crowns or marks, but a capital P on the bottom…..
Hi, can anyone tell me what GR 64 Crown marked glass with 1/4Gill is worth? Thanks. I’m looking for a dimpled beer glass from the ‘sixties – early ‘seventies that was phased out when a kerfuffle about measures saw the introduction of a taller, slimmer version with a rim, intended to mark where the pint finished and the head began. The one I’m thinking of is shorter, slightly more convex, stubbier and rather heavier than the dimpled glass that replaced it, it’s walls slightly thicker/chunkier. The handle seemed quite high up the glass instead of centrally located but the absence of an area to accommodate the head, introduced by the new version, probably accounts for that impression. Can anyone tell me what it was called [if it had a classification at all that is]. Could it have been one of these ‘nonicks’? Memory is no ally at my time of life. I just remember drinking draught Bass out of these as I sat by the fire in my college local. That would be 1971. They weren’t that common even then, and as I recall seemed to have disappeared altogether by 1974/5 or so. Grateful for an help. A ‘Nonik” never has a handle, or dimples. I doubt the glass you’re describing had a specific name. Ah right. I expect it was some local manufacture long since lost to posterity. Thanks for helping. Are you familiar with dimple mugs made in England and bearing the Ravenhead name without the Ravenhead logo? I have one bearing the post-1968 crown stamp and the 478 St. Helens number. I understand that RayWare used the Ravenhead name and logo after about 2003 or so but that RayWare’s mugs were not made in England. Might there have been a period – perhaps from around 1969 to around1972 – between the time Ravenhead started putting its name on mugs and the time the logo was adopted? I have a half pint dimple glass with royal insignia in raised relief on the side facing a right handed drinker. The glass colour is yellowish with some air bubbles. The insignia is ER not EIIR. with a male crown.It looks as if it may relate to King Edward VIIs delayed fraught coronation. Can anyone enlighten me please.? In the 2012 film Dawn Raider, set in 1883, there are dimpled mugs on the bar. Is this correct? 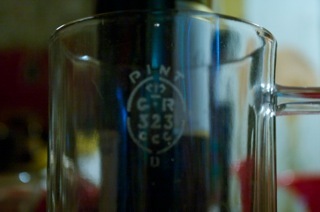 I have a 10 sided pint glass stamped GR323 GCC. On the bottom of the glass are the words “British made”. I was wondering if this is likely to be a genuine vintage, as it seems surprising that they would have printed these words on a glass in those days; I assumed it was more modern times where so much is made abroad that manufacturers highlight the point if something is made in this country? Having done a few google searches it seems a number of other people with this stamp have the same words on the bottom so maybe it is genuine, but interested in your view? The requirement to have manufactured items stamped with the country of origin dates back to before the First World War. 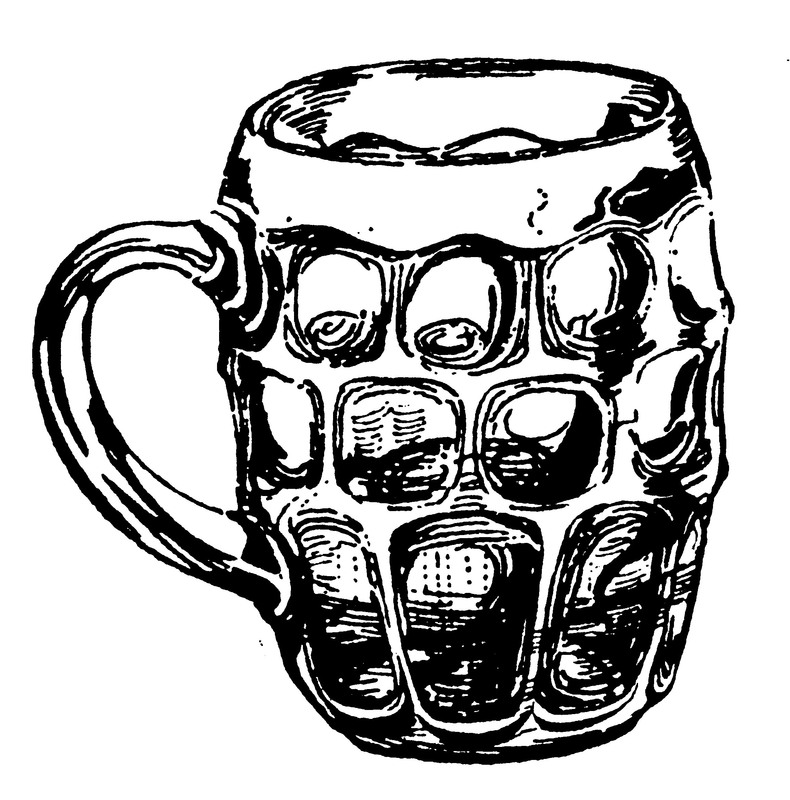 Where did you find the clipart of this dimpled pint? 🙂 I want to use it for a logo, but don’t know where it origins. My husband has a beer glass that tapers out, has 16 ‘grooves’ from the bottom to just over half way up then it’s smooth. It has the GR with a crown, 64 as well as the word pint. Any ideas? Loved reading the articles on beer glasses. I found a GR 64 among my glasses 10 sided so looked it up. It is in good condition but has a very uneven base so it tilts towards the handle. Huntsman was the trademark of Eldridge Pope of Dorchester. It licensed the Huntsman logo in the South West, which was also used by Tetley of Leeds in the North and Rayment’s in ther Home Counties. 323 was the stamp for Gateshead. Hi have collected beer glasses for some time, found a straight sided pint glass with a naafi stamp and the pint stamp looks like g crown r 64, think its from newcastle upon Tyne the base is shallow with a rough edge, glass is old looking and mottled. Type that Andy Capp would drink out of. Any advice would be useful. 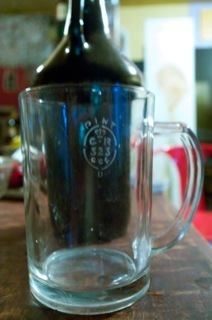 Ref.my previous post, does anyone know of a list of beer glass stamp numbers. There used to be one on the abeercollector website but this site is no longer available. I now have a collection of over thirty glasses the oldest are a VR 323 Gateshead 10 sided half pint and an ER 323 Edward VII heavy tapered pint, all bought at charity shops etc.